The Montclair Police Department, Montclair Fire Department, and Montclair Ambulance Unit have collaborated through Lifelong Montclair, the Township’s aging in place initiative, to give our senior residents more peace of mind. “Operation Blue Angel” is intended to provide Police, Fire and Emergency Medical Services (EMS) access to a residence in the event of an emergency where the resident is unable to open the door. As part of funding from the Partners for Health Foundation, eligible residents will be provided with a free lock box. The key, provided by the applicant, will be stored in the secure lock box near the entrance to their residence. 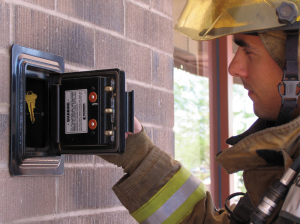 The access code to the lock box will only be available to first responder personnel and used only during an emergency. The Community Service Unit (CSU) supervisor will assign an officer from the unit to respond to the applicant residence to recode the lockbox. Whenever the lock box is entered during the hours when the CSU is not available dispatch will send an email and voicemail to the supervisor of the CSU advising him/her of the incident. The applicant and/or the emergency contact person listed on their application will be provided with the new code. The new code will transmit to dispatch via email and logged by the Lock Box Coordinator. To be eligible to enroll in “Operation Blue Angel” lock box program, Montclair residents should meet the following requirements: they must be 55 years or older or have medical conditions that could lead to incapacitation and live alone or are alone for extended periods of time on a regular basis.